Record any sound, then reproduce it on the press of an external switch. Great communication device. Give a person the power to get attention, and to say 'Yes', 'No', 'Stop', 'Start', 'Happy Brithday', 'Please', 'Thankyou' and so on. Get more involved in games. E.g. Adventure Game books - where you are the hero in a story making all the choices as to what to do. Make your own deliberate/random choices in Art and Music creation. Choose a chapter in a book of short stories: Record "That One!" into the Talking Tin, then read out each story title until the person presses their switch. "That One!" is spoken, a choice is made, and you can then read the story. Whether random or deliberate, it is THEIR choice, not yours. 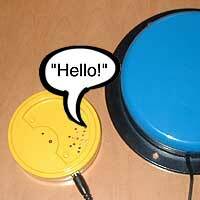 Do it Yourself - Adapt your own switch operated Talking Tin. Talking Tins - The Original Talking Tins excellent web-site.